With the trials and tribulations of Kentucky Derby 2012 past, I was hoping for some quality Kentucky sightseeing. I knew that Bourbon Country was nearby, and I really wanted to see what that was all about. I'm really glad we did. It was Sunday, and it took us a while to get our lives together, eat, and get out of Louisville. This was one of those days where you wander around with no purpose and everything just works out. My kind of day. We were looking for somewhere unique to have lunch, and Lynn's Paradise Cafe fit the bill. It was filled with wacky stuff inside and out. There was a man walking around inside in a horse costume, for example. The wait for a table was like 2 hours though, so our time here was short. We continued towards Bourbonland hoping to find something to eat with little success. We eventually gave up and ate at a Waffle House. We then drove to one of the closest bourbon operations from Louisville, Jim Beam. Beam was one of the nicer places that we went to. They put a strong emphasis on their history and storytelling. I could smell the bourbon from the parking lot. It was a really sweet almost caramel or maple syrup sort of smell. Earthy and sweet at the same time. The first thing one sees are these giant barn looking structures called rack houses. Bourbon has to be aged at least briefly to legally be a bourbon, but the length of time varies drastically. I can't remember exactly, but I think 12 years might have been the oldest I heard of during the trip. The mass market white label Jim Beam is aged 4 years. A bourbon like that will be blended though, so it will probably contain older bourbons, but the label has to read the youngest year in the bottle. The warehouses were by far the coolest part. Except for the tourist fitted ones, the average warehouse has no electricity and minimal metal to avoid sparks. I saw a couple of pictures of what happens when a place filled with booze catches fire. It's pretty intense. The buildings are spaced a good ways apart so as not to domino each other, as awesome as that would be. Anatomy of a Beam Bourbon aging warehouse. David Beam first adopted this innovative warehouse to work in harmony with the seasons. Built tall like a chimney, so the hot air rises to the top, and fresh air following in the bottom vent. We don't heat our warehouses and we don't cool them either. We give nature that responsibility. As a result, the hot Kentucky summers and cold winters play a big role in aging-and shaping-our whiskies. During the summer, our Bourbon expands and during the winter, it contracts, subtly changing the way those charred whiskey-filled barrels mature. Seven to nine stories tall, these warehouses hold around 20,000 barrels each. That's over a million gallons of Beam whiskey in each structure. Every barrel space has its own aging characteristic, depending upon its position in the warehouse. And the aged whiskey character mirrors that variety. Thus is the opportunity, Beam Bourbon-makers have mastered the "Art of the Cross-Section". "Cross-Sectioning" is a process of selecting barrels from across the house-top to bottom and inside out. Mingling select barrels in the "right" combinations, produces the complex and distinctive flavors that make Beam Bourbons the finest in the world. Not only are the barrels apparently rolled by hand down these narrows passages, but the barrel has to be rolled perfectly so that the plug is facing upwards. Our guide said that if a barrel leaks they can't just patch it with whatever because it would come in contact with the bourbon and ruin the magic. They would use an old school method of shoving a slice of cattail into the space between the wooden slats. This would expand and hopefully stop the leak. I had to resist sticking my tongue out when I spotted a leak. Here was a reproduction of the traditional way of making the bourbon. Booker Noe, grandson of Jim Beam. The fact that there was a Jim Beam leather biker jacket, just the right size, on the sale rack in the gift shop seemed to me to be a sign that we shouldn't ignore. The gift shop also featured tastings of various bourbons. I'm pretty much an expert now. Old stencils used to label the barrels. Next on our journey was Bardstown, the self proclaimed Bourbon Capital of the World. We stopped by the Oscar Getz Museum of Whiskey to brush up on our history. My favorite part of the museum was the artifacts from Prohibition. What a stupid time in American history. The federal government was a popular topic during the Beam tour, and it is an important part of the story of bourbon. Prohibition obviously had a large impact, but even present day they said the government is very much involved in their business. I believe the figure tossed out was that 60% of the cost of a bottle of whiskey is taxes applied to liqour before it's even bottled. Because the government gains such a large amount of revenue from this business, they watch it like a hawk and regulate it in numerous ways. The term "bourbon" itself is protected by Congress and enforced internationally through trade agreements. 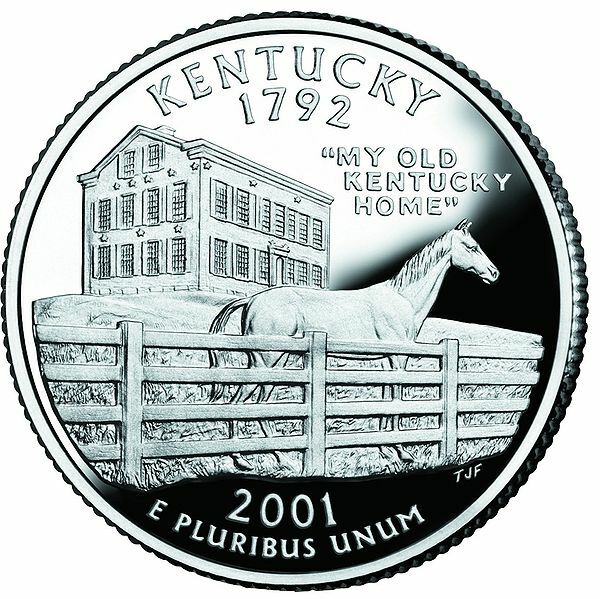 For example a bourbon must be produced in the US. It doesn't have to be made in Kentucky, but something like 95% of it is anyway because Kentucky has magical water and the right grains and whatnot. The law also saws that their can't be any added flavors or colors or anything, which I appreciate. I think I am a convert due to just the American and natural aspects. This was one of my favorites. If you drink liquor, the troops are going to starve. Why do you hate America? Oh my favorite part of the Prohibition story was the federal government filling the law with loopholes for its friends. Certain distilleries were allowed to continue operation in order to produce alcohol for medicinal purposes. It was really startling how similar the situation at that time is to our current ridiculous treatment of marijuana. I don't smoke it personally, but I'm sure it will become legal in my lifetime. Our tour guide spoke about the barrel "char" that Jim Beam used, and said that it differed with different manufacturers. We both agreed they all looked the same. "Jim Beam Distillery, 1938" It doesn't look much different now. Downtown Bardstown was decent looking and kinda touristy. By the time we got there everything was closed, but it was still nice for a stroll. White trash chalices were for sale. We happened upon the old Kentucky plantation home called Federal Hill that supposedly inspired Kentucky's state song "My Old Kentucky Home" which is sung at the Kentucky Derby. According to Wikipedia this story is BS, but the place is still a state park. Amusingly, it wasn't until 1986 that the song's lyrics were changed from "darkies" to "people". 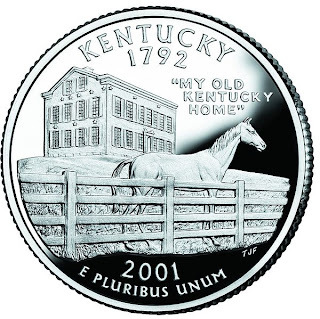 The home is featured on the reverse of Kentucky's state quarter. The place reminded me of Beecher Hall a bit. A sort of strange statue of the song's author, Stephen Collins Foster, likely about to be stepped on by a giant. I insisted that Lydia try the Derby Pie. The only other time I've had it was at last year's Derby. We ate the pie right out of the pan like a couple of hobos. It was breakfast, and dessert, and probably another meal. View Kentucky Trip in a larger map To complete the awesome make-it-up-as-we-go nature of the day, we had not reserved any lodging. We decided on this kind of run down little motel near the center of town. I don't think I've ever stayed at a place like that before. It was pretty great. What is in the Derby Pie? It looks like a pecan pie. Yeah Derby Pie is pretty close to pecan pie. It does have the addition of chocolate pieces in it though, which is a big improvement. It was also a lot less goopy in the middle that the typical pecan pie. Good stuff.